We hope the updates in this newsletter are helpful to you, and we welcome your feedback on the topics that matter most to you, so we can continue to expand and improve these regular updates to our membership. In addition to our newsletter, we hope you will connect with us on social media. Find and follow TxANA on Facebook, Twitter and Instagram. It’s another easy way to stay informed and involved in your association. 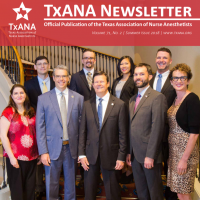 TxANA is stronger because of member engagement from you and our colleagues across the state. Thank you for all you do for the CRNA profession!